Integrating up to 12GB of RAM and the Snapdragon 855 processor, the Xiaomi Black Shark has nothing to envy the Galaxy S10 Plus, especially when it has a starting price of about the US $425. For a few years some companies, like Razer, have thought of launching phones “aimed at the gamer market,” with better hardware and some other difference. Now, Xiaomi is back to the trend with the second generation of its Black Shark gaming smartphone, this time with a very interesting screen. The Xiaomi Black Shark was the cell that has most managed to become a Nintendo Switch and the Chinese company is still working on improving that phone focused on video games with the Black Shark 2. The Xiaomi Black Shark 2 was announced this Monday, March 18, and although its name indicates that it is the second generation of the Xiaomi gamers’ smartphone, it is actually the third generation, after the Black Shark and the Black Shark Helo that were announced on last year. Just look at the dimensions of the phone to realize that something has changed in this year of life of the brand of Xiaomi for gamers. We have a phone two millimeters higher, a little narrower and also thinner, but that against weighs more than its predecessor. And this is mainly due to the fact that the screen, one of the heaviest elements of a smartphone, has grown diagonally. The Black Shark has a 6.39-inch OLED panel that, in addition to great image quality and reduced response time when touched, has a special feature: it is sensitive to pressure. It means, according to Xiaomi, that users will be able to access buttons and functions for gaming pressing with more force than normal sections of the screen. Nothing changes in density, because although the resolution is now 2,340 x 1,080 pixels, it remains at 400 pixels per inch. In front of the rectangular screen of the primal Black Shark, now we have a cut in the shape of a drop of water on top. In front of the LCD of the model that started it all, now we have an AMOLED panel that also has DC Light-dimmer to subtract visual fatigue. The Xiaomi Black Shark 2 also features the “Master Touch” feature that allows users to firmly press the right and left aside to activate different customizable actions. The beating heart of Black Shark 2 is the Qualcomm Snapdragon 855 processor supported by 12 GB of LPDDR4X RAM and an internal storage that reaches 256 GB (UFS 2.1) that cannot be expanded and ready to run Fortnite, PUBG, Asphalt 9 or any game that we want to bring to this device whose performance in video games should be at the top. One of the most interesting features is the liquid cooling system capable of reaching 14 degrees less than a common heat dissipation system. This system allows you to play even for long sessions, pushing the GPU (Adreno 640) and the CPU to the maximum and avoiding overheating of them and other components. To take full advantage of the potential of the new device, you can play games in Ludicrous mode and enjoy an uncompromising performance. Something that also must be attributed to the sound of the device, which has two stereo front speakers 25% larger than the average smartphone today. And also, with three microphones to cancel the noise with two of them, and communicate with each other. Undoubtedly, a phone to keep in mind and that can be a step ahead of the original Black Shark. But let’s talk about photography. Xiaomi has already opted for the double camera with the Black Shark presented in April 2018, and did so with a team of 12 and 20 megapixels, in which one sensor was the main and the other provided optical zoom. Both offered f/1.8 lenses to achieve good luminosity even in dark situations, but that has changed with the new generation. The new Xiaomi Black Shark 2 comes with two twin sensors, two sensors of 12 megapixels each in which the lens of one becomes brighter with f/1.75, while the lens of the other becomes darker with f/2.2. The artificial intelligence added to what we suppose will be MIUI 10 on Android Pie, although it has been too clear. If we turn the phone, we have the front camera, before on the frame and now on the ‘notch’, which maintains the resolution of 20 megapixels but also becomes brighter. We leave behind the front lens f/2.2 to embrace an f/2.0 that should offer better results in selfies. The Black Shark 2 comes in silver and black in four versions and different colors. 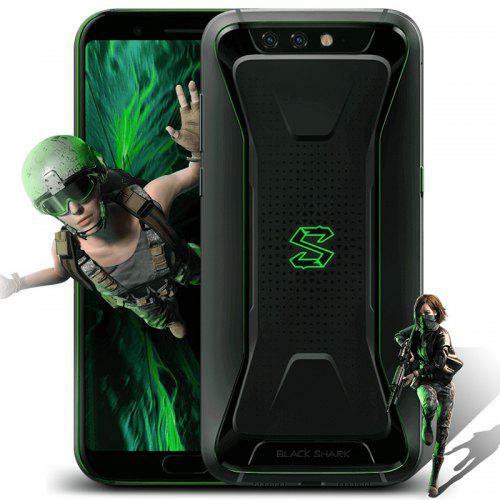 Black Shark 2 with 6GB RAM/128 GB storage: 3.199 yuan, 420 euros to change. Black Shark 2 with 8GB RAM/128 GB storage: 3499 yuan, 459.4 euros to change. Black Shark 2 with 8 GB RAM/256 GB storage: 3,799 yuan, 498.8 euros to change. Black Shark 2 with 12 GB RAM/256 GB storage: 4,199 yuan, 551.31 euros to change. In China, it is already available for your reservation and the distribution will start on March 22, but the release date for the international market is unknown.